Maccaferri Mexico stabilized a compromised slope subject to constant landslide using Rock Mesh B900, and 3m deep anchors. Maccaferri has long dedicated itself to the protection of the environment. It has been a corporate goal to offer erosion protection solutions to client worldwide. This application area involves mitigation works, preventing damage caused by slipping rocks from vulnerable slopes. The range of MacRO systems from Maccaferri is a full range of systems to mitigate natural hazard and also feature design tools. Using this bespoke design software, we assist clients with their erosion needs, providing optimized, value for money solutions. Mexico’s geography is filled with steep soil facades. Such facades are often compromised by landslides and erosion. In May 2015, Maccaferri found an unstable slope that had been subjected to constant landslides during the last two years. This hill is made up of fine rocky material. While an old gabion wall was already present at the site, it was nonetheless deemed as insufficient after failing to protect the slope from erosion and rockfall in the past year. 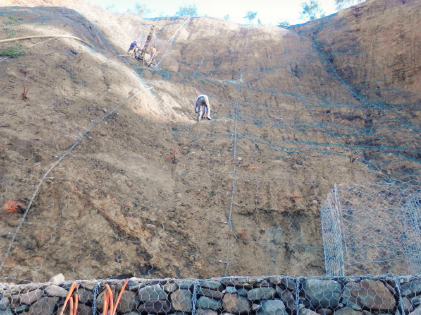 Maccaferri de México’s solution was to perform a gradient stabilization with Rock Mesh B900. Rock Mesh, is made up of an association of steel cables placed longitudinally 8.0mm diameter (Steel Grid MO), or in both directions (Rock Mesh BO). The mesh is hexagonal and double twisted. The mesh system was positioned with 3 m thick anchors designed to withhold any fallen material. The anchors were furthermore placed at the bottom of the constructed gabion wall to contain any slippage—mainly the fine material that conforms the slope and that could overcome the mesh.